Needing a roll off dumpster for a cleanup project, construction job, or demolition work? Dumpster ShopShop is the place to find your roll off dumpster. Find Preferred Vendors in your local area that provide roll off dumpster service by clicking on the city nearest to you in the red box. Our Preferred Vendors offer many dumpster types so you can get the right size for your project. Roll off dumpster sizes are measured in cubic yards. Typical roll off dumpster sizes are 10-15, 20, 30 & 40 yard dumpsters. 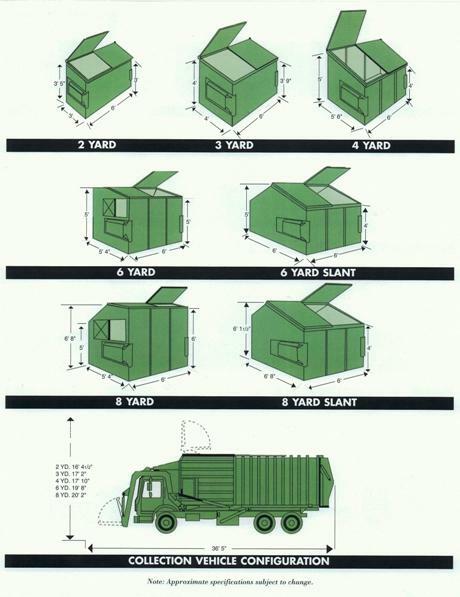 We've included the dumpster dimensions for each of these roll off dumpster sizes below. These dumpster rentals are perfect for junk removal, or your next small-scale construction or landscaping project. Their compact size makes them easy to load while not taking up too much space on your property. How big is this dumpster? * Actual trash dumpster sizes vary per manufacturer. * Please allow at least 10’ of space behind the dumpster for the swinging door to open. How much can this trash dumpster hold? *The average pickup-truck holds about 2 yards of material so this roll-off dumpster holds approximately 5 to 7 full size pick-up truck loads. These dumpsters are ideal for hoarder clean out projects, construction, remodeling, roofing, siding, and landscaping debris. Also perfect for property management tenant move-outs. *The average pickup-truck holds approximately 2 yards of material so this roll off dumpster holds about 10 full size pick-up truck loads. These dumpsters are ideal for large clean-up projects, commercial construction, manufacturing facilities, roofing, and roadside construction. *The average pickup-truck holds approximately 2 yards of material so this roll off dumpster holds about 15 full size pick-up truck loads. These dumpsters are ideal for your next large-scale land clearing projects, demolition projects, warehouse loading docks, massive storm cleanup, and industrial facilities such as power plants or paper mills. *The average pickup-truck holds approximately 2 yards of material so this roll off dumpster holds approximately 20 full size pick-up truck loads. Examples of this include dirt, concrete, bricks and asphalt. This material can be reused as gravel or fill. A 20 YD roll off dumpster is used for this type of debris. Examples of this include tree limbs, stumps, mulch, sod and organic material. This material is reused for landscaping or fuel. Any size roll off dumpster is available for this type of material. Examples of metal items include appliances, A/C units, car parts, windows, copper, brass, and aluminum. This material is reused to create building products. Any size roll off dumpster is available for this type of material. Examples include any paper or cardboard material; from cardboard boxes to magazines to computer paper. This material is recycled to make pulp; creating paper products. Any size roll off dumpster is available for this type of material. Tire examples include car tires, truck tires or any rubber material. Plastic examples include packaging material, water bottles, plastic wrap, and plastic toys. This is recycled to make pallets, doormats, and playground material. Any size roll off dumpster is available for this type of material. When selecting a dumpster service for long term use, you have several things to consider - recycling options, reuse methods, contract terms, equipment needed and pricing. Dumpster sizes and dimensions will vary according to manufacturer. You need a waste provider in your local area who will work with you to ensure you are getting exactly what you need. Our Preferred Vendors will provide a complete waste analysis on your waste stream and make a solid recommendation based on experience from waste haulers in your local area. For permanent waste management; perfect for restaurants, grocery stores, hospitals, gas stations or most business use. They can be used for both, garbage and recycle needs. 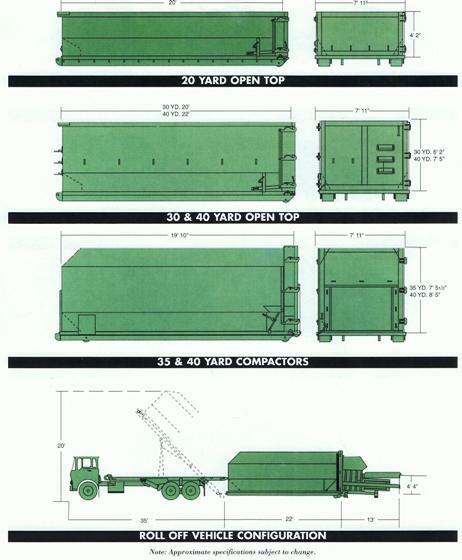 Front Load dumpsters are available in 2, 4, 6, and 8 yard sizes. Dumpster sizes and dimensions will vary according to manufacturer. Your local Preferred Vendor will consult with you regarding your specific needs. Self contained or break-away compactors are used for massive garbage collection at the following sites: grocery stores, apartment complexes, shopping malls and factories. They can be purchased or leased, depending on your specific needs. Dumpster Shop is the best option for your portable toilet needs. Our Preferred Vendors offer everything from a basic porta potty to deluxe styles appropriate for special events. In addition to offering portable restrooms for any occasion, we pride ourselves on providing the most professional vendors in the business. Our consultants will work with you to provide solutions for your event or construction site. Our Preferred Vendors have the experience, the competence to provide you exceptional service. At Dumpster Shop, you can expect the best! *Ask your Preferred Vendor about bundling waste service with sanitation service to get a special discount. When determining the number of restrooms for your commercial or construction site, ANSI standards call for one portable toilet per 10 workers for a 40-hour work week. Our Preferred Vendors will consult with you to determine what you need according to your individual circumstances. Some options for your event include sinks, showers, standard toilets, trailers, hand sanitizers, handicapped accessible, and luxury trailers. Our experienced consultants will gather information and work with you to determine what best meets your unique needs. The standard in portable toilets for special events. A spacious unit that includes a flushing toilet, running water and solar lighting. Extra space for handicap individuals and great for families. Bring toilets to your site workers on buildings. fields or on road construction. Want us to do heavy lifting? finish by cleaning up the area.